The plaque commemorates World War One soldier, William (Billy) Edward Sing. The plaque was unveiled on the 50th anniversary of his death. Billy Sing was born in Clermont to a Chinese born father and was a member of the Proserpine Rifle Club and also spent time as a Kangaroo shooter in Proserpine. After signing up to the army two months after the break out of World War One, Sing served as dismounted infantry at Gallipoli and has been referred to as the most successful sniper from any country during the First World War with the figure of more than 200 kills. He died nearly penniless in 1943 in a West End boarding house, a forgotten hero. Born at Clermont 2-3-1886, and died here on May 19, 1943 at 304 Montague Road, West End, in a house that then stood. the Commander of the Allies Forces and others. This soldier of World War One, serving from 1915 - 1918 at gallipoli, and in France, skilfully carried out unenviable duties as a sniper and other hazardous activites with incredible distinction. 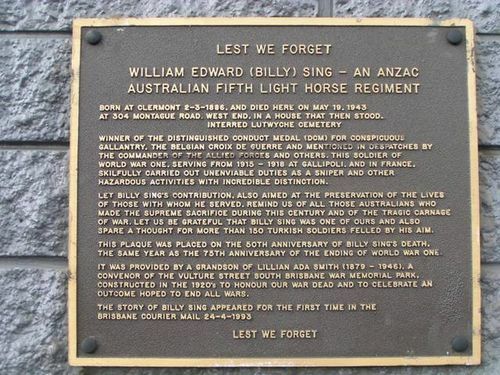 Let Billy Sing`s contribution also aimed at the preservation of the lives of those with whome he served, remind us of all those Australians who made the supreme sacrifice during this century and of the tragic carnage of war. Let us be grateful that Billy Sing was one of ours and also spare a thought for more than 150 Turkish soldiers felled by his aim. This plaque was placed on the 50th anniversary of Billy Sing`s death. the same year as the 75th anniversary of the ending of World War One. It was provided by a grandson of Lillian Ada Smith(1879 -1946) a convenor of the Vulture Street South Brisbane War Memorial Park, constructed in the 1920s to honour our war dead and to celbrate an outcome hoped to end all wars.